HighStar Healthcare’s Universal Sling is intended as a general transfer sling. Providing excellent trunk and thigh support, the Universal is available with or without head support and is appropriate even for clients who have limited upper body tone. For best results when toileting, remove necessary clothing prior to application. 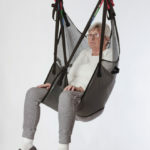 This sling is compatible with any floor or ceiling lift that accepts loop-style slings. Call 604-821-0075 or request details about the High Star Universal Spacer Fabric Sling using the form below. Question about the High Star Universal Spacer Fabric Sling ?